Hohoho! The holiday season is rapidly approaching and it’s time to make your list and check it twice. We all like to give our family and friends lovely things to let them know we love them, but these holiday gifts don’t have to break our bank accounts! I found some really great “do it yourself” DIY tea gifts online that I like, and, hopefully, you will like them as well. 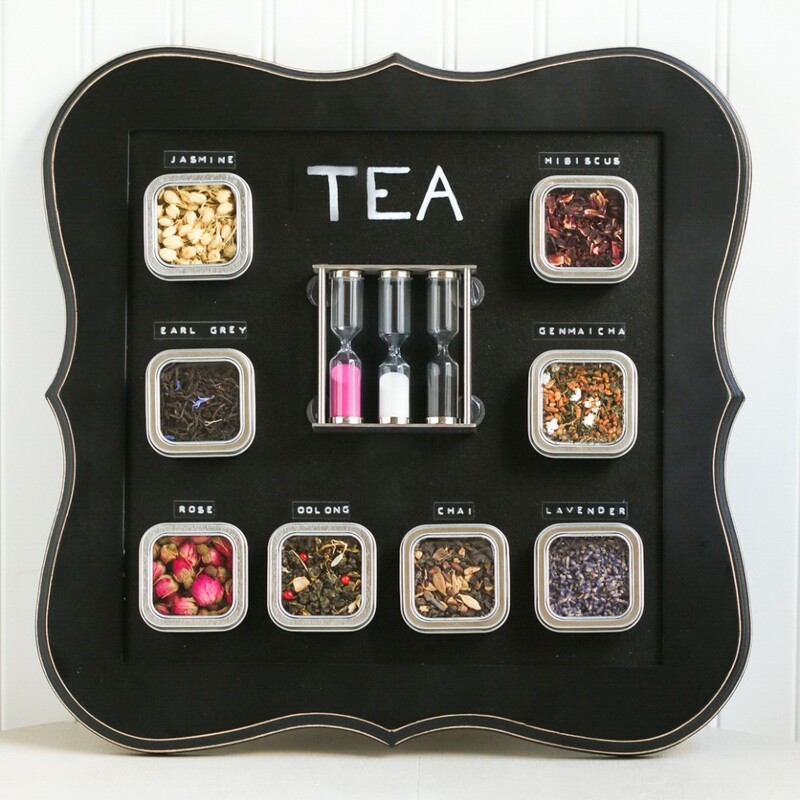 Make a Magnetic Tea Chalkboard. The teas or herbs in this gift can be packaged individually so your friends can create their own blends, or you can fill the tins with your favorite tea blends for them to try – like our popular holiday teas! 2. 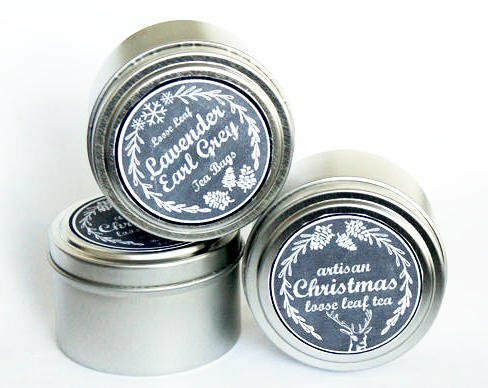 Fill 1 Ounce Tea Tins with your favorite teas and create beautiful chalkboard labels. 3. 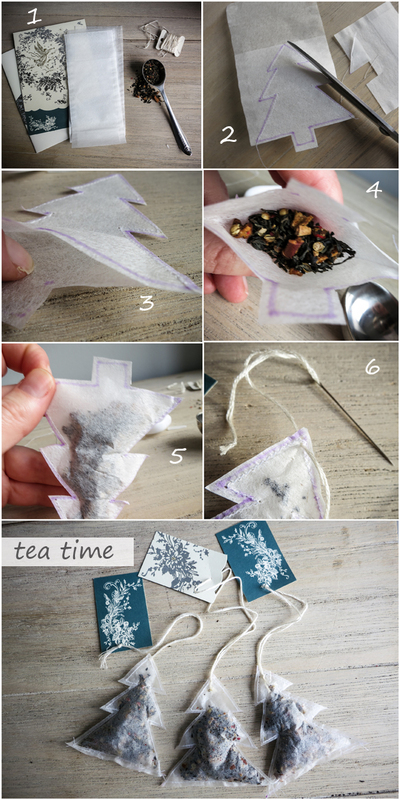 Make your own Christmas Tree shaped Teabags. This makes a great gift for your favorite tea drinking co-worker! 4. Make Christmas Ornaments with loose leaf tea in them! I searched online for fillable ornaments and found: Amazon, Consumer Crafts, Oriental Trading, Michaels, and many more places. I found the ornaments below at JoAnn’s Fabrics. To make the ornaments, simply open the ornaments, clean them (and allow to fully dry), then fill with your favorite S&V tea. Tea Filled Ornaments: Candy Cane (top left), Blueberry Cinnamon Crumble (top right), Chai Black (bottom left) and Lavender Lace (bottom right). Buy one of the 350+ teas on our list to make your gifts. We have many popular blends such as our holiday tea line, dessert tea line, literary (author) tea line, and so much more. Happy crafting! And Happy Holidays!